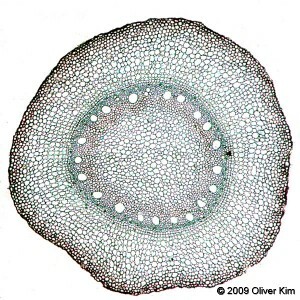 Root cross section of a monocot plant, Zea mays, maize, corn. This is another panorama photomicrograph, assembled from four individual images. The image shows a cross-section of Zea mays, maize, a monocotyledonous plant (“monocot”). The picture shows epidermis (the outside layer of cells), endodermis (inside ring-shaped layer of smaller cells) and vascular tissue, the larger cells inside the endodermis, which carries water and nutrients. The water of the soil has to reach the vascular tissue towards the center of the root and is forced to go through the endodermis, which acts as a “filter”.